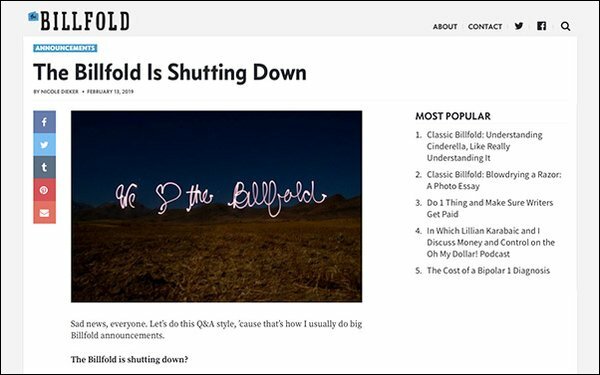 Personal finance blog The Billfold is shutting down after operating for seven years. That, in addition to the fact The Billfold LLC “was an offshoot of an existing business rather than a new business," led to the demise of the blog. “After beginning the 2018 tax process, realizing what I'd gotten myself into, and having the CPA/lawyer conversation that I should have had a year ago, I evaluated my various options and chose this one," she wrote. The Billfold's remarkably engaged audience demanded to know more details about what brought the site down. Billfold posts will continue to run through Wednesday, February 20. The archives will remain untouched. The Billfold was part of the The Awl Network, which once ran a group of four websites until it closed the women-focused site The Hairpin and indie news and pop-culture site The Awl in January 2018, citing a tough revenue climate for independent publishers. In 2017, The Awl Network had taken its sites off online-publishing platform Medium. Last March, New York Media acquired the comedy site Splitsider from The Awl Network.